Home > Stuff for Mums > Celebrity News > The Water Wait Is Over! The water wait is over. In a marketplace crowded with brands that leave consumers thirsty for more, Aussies can now enjoy the wide-ranging benefits of highly alkalised and electrolyte-enhanced water with the highly anticipated arrival of leading US brand, AQUAhydrate. Dubbed Australia’s most exciting sports hydration drink, AQUAhydrate addresses Australian consumers' growing need for healthy alternatives to aid their performance lifestyle. Through a proprietary process, its water is purified to some of the most rigorous standards in the industry, supplemented with 72 bio available electrolytes and natural trace minerals, and then raised to an alkaline pH of over 9+. It is this powerful synergy between alkalinity, electrolytes and minerals fuels ultimate hydration, balance and performance - making AQUAhydrate the water of choice for health and fitness authorities and professional athletes. Boasting investors such as actor/producer Mark Wahlberg and entertainment powerhouse Sean “Diddy” Combs, AQUAhydrate is fast becoming an iconic brand for the millennial generation of savvy consumers, who are switching away from high calorie artificial beverages and reverting back to quality performance-oriented drinking water. Mark Wahlberg invested in AQUAhydrate after finding it boosted his performance when training for his role as a boxer in the movie The Fighter: “I was recovering faster, I was able to train better. AQUAhydrate has been a phenomenonal success in the US, and I am thrilled to see it hit Australian shores. The Aussie lifestyle is focused on the outdoors and being fit”, so AQUAhydrate is the perfect hydration partner. With such a strong sporting culture, it makes sense that AQUAhydrate is available Down Under.” Mr Wahlberg shared this information with his friend and entertainment powerhouse Sean “Diddy” Combs who was immediately a fan: “Unlike other waters you actually feel the difference. It’s cleansing, nourishing and aids recovery” he commented. AQUAhydrate has already attracted a loyal following of elite Australian sports people – from car racing to cross training – thanks to the amazing results they see from its consumption. Another elite Australian sports star who has made the switch to AQUAhydrate is Garth Tander - a V8 Supercars driver on the Holden Racing Team says, AQUAhydrate allows him to remain rehydrated when racing on the track. "For me, given how much we sweat in the race car, fluid replacement and rehydration is critical. Using AQUAhydrate gives me the benefit of rehydration and it doesn't have the sweet, sickly taste of other sports drinks. This means I can drink more of it and better prepare myself for the races ahead." AQUAhydrate contains 72 natural electrolytes, compared to Powerade and Gatorade which have 3 to 4 artificial electrolytes. The water is also raised to a high alkaline pH of 9 without the use of liquid concentrates or additives. It makes the perfect pre- and post-workout beverage as it delivers a more efficient recovery between sessions, by flushing out lactic acid. AQUAhydrate is also ultra clean so the taste is crisp and pure. Through a proprietary, multi-step process, the water is purified to some of the most rigorous standards in the industry. Suitable for people of all ages, including pregnant women, AQUAhydrate helps balance your pH levels and is available nationwide in Priceline Pharmacies, Healthy Life stores, Complete Supplements Australia, Go Vita plus selected IGA and Supabarn stores. 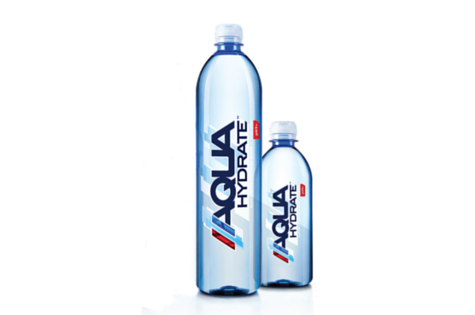 AQUAhydrate comes in 500ml and 1 litre bottles. AQUAhydrate is available globally. In Australia it is available nationwide in Priceline Pharmacy, Healthy Life, CSA and selected IGA stores..